✔【HEAVY -DUTY METAL FRAME 】: The massage chair constructed of heavy-duty grade, portable massage chair lightweight and tremendously strong, and tattoo chair covered high gloss powder-coated finish, which greatly extends the massage chair service life. Massage chair portable massage tattoo chair. ✔【HIGH DENSITY FOAM】: Massage Chair is fill of high-density foam upholstered, the thick foam portable massage chair give you superior comfort and durability. The overall stability of the massage chair is enough to support 300 lbs, the static capacity: 700 lbs. 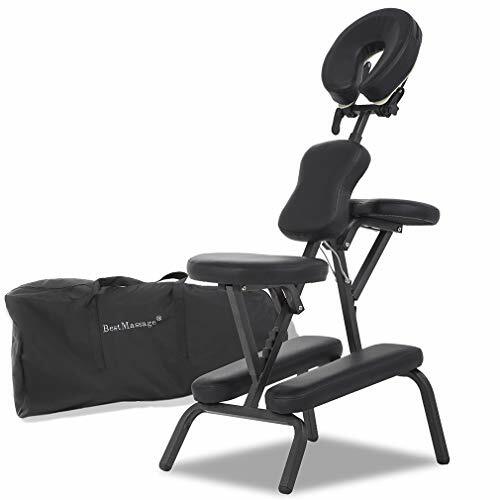 Folding massage chair tattoo chair therapy chair. ✔【WATER&OIL PROOFING&EASY TO CLEAN】: The massage chair cover PU leather, it is water and oil proofing, you can clean the tattoo chair easily, the portable massage chair ensure a luxuriously comfortable therapeutic massage experience for you. Massage chair portable folding massage chair tattoo chair. ✔【FOLDS COMPACTLY&SPACE-SAVING】: The massage chair with compact and foldable flat design along with a sturdy nylon carry case, the massage is space-saving and easy for storage. Massage chair itself only weighs 23lbs, You can take the massage chair where you want to go. Portable massage chair folding massage chair tattoo chair. ✔【SIMPLY ASSEMBLY】: This massage chair doesn't require any tools to be assembled. All the accessories are in the carton. You can expand the massage chair according to the instructions, It only takes 3 minutes. Start enjoying the massage experience. Portable massage chair tattoo massage chair folding massage chair.